New York, NY – Ralph Pucci: The Art of the Mannequin explores the work of New York-based designer Ralph Pucci, widely regarded for his innovative approach to the familiar form of the mannequin. 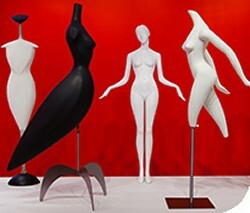 Having collaborated with the likes of Diane von Furstenberg, Patrick Naggar, Andrée Putman, Kenny Scharf, Anna Sui, Isabel and Ruben Toledo, and Christy Turlington, Pucci’s mannequins not only expand the parameters of this ubiquitous sculptural form, but reflect major cultural trends of the past three decades. Further info….